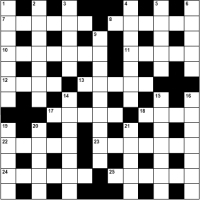 Crossword puzzles are an ideal addition to any magazine or publication, in the Puzzles section. They are also ideal content for a prize competition. You can buy crossword puzzles we supply licensed for publication in PDF or EPS format, as per the sample above. Please note in addition to standard quick crosswords we can now also supply Custom Crosswords on a theme of your choice. Popular themes include Entertainment crosswords, with clues and answers on the world of celebrity, film and TV. Also popular is the Sport crossword, with clues and answers covering a wide range of sports. We also offer General Knowledge Crosswords. If you require crossword puzzles, whether one or hundreds, please let us know your requirements below, and we'll swiftly get back to you with a response and quote, if appropriate.